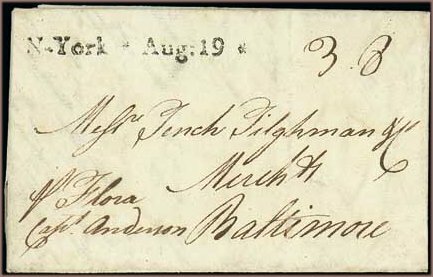 Entire dated 19th May 1784 sent from Liverpool to Baltimore via New York. Ship Letter Fee: 16 gr. The US ship letter fee of 16 gr per letter applied from 1711 to 1792. The inland rate applied from 1st January 1782 to 5th April 1788. 'N. York * ' straight line ship mark. Reference: Linn's World Stamp Almanac, 5th Edition.